Shannon Loutitt doesn’t run to win medals. She doesn’t even run primarily to stay in shape. For Shannon, a proud Métis woman born in Yellowknife, Northwest Territories, every step she runs is taken in memory and honour of her great-grandfather Billy Loutit. Prior to February 2004, Shannon had never heard of her legendary ancestor. She was still adjusting to life as a non-smoker, having recently kicked a 17-year smoking habit, and was only beginning to get into physical activity, taking long walks and the occasional jaunt on a treadmill she’d inherited. But in February 2004, while attending a relative’s funeral, Shannon caught up with her second cousin Carol, whom she hadn’t seen in many years. It so happened that Carol had been reading up on the family’s lineage and stumbled across something called the Billy Loutit Despatch Triathlon. As Carol discovered, the triathlon is an annual event held in Athabasca, Alberta in honour of the man who, 100 years prior, ran 100 miles from Athabasca to Edmonton to save the community from impending flooding due to an ice jam. At that time, Hudson’s Bay Company played an integral role in the community and stood to lose a great deal from the flood. But in 1904, a small town such as Athabasca had no means of instant communication. So Hudson’s Bay got help the only way it knew how; the company sent two messengers to the nearest city, one on horseback and another, Billy, on foot. Billy beat the horse by one hour, running the rough terrain to Edmonton in 16 hours. The run wasn’t the first for Billy, who had established himself as a gifted distance runner and once ran more than 200 miles in three days to carry a dispatch for the North-West Mounted Police (now the Royal Canadian Mounted Police). But it was a run that saved the community and forever indebted Hudson’s Bay to him. For that reason, when he succumbed to stomach cancer in 1947, the company paid for him to be treated and buried in Edmonton, where he rested until Shannon brought his spirit home on an epic honour run in 2008. But let’s run back to 2004 for a minute. The day Shannon learned about her great-grandfather marked the beginning of an exciting new chapter in her life. During the funeral reception, cousin Carol pulled Shannon and their aunt Sara aside to fill them in on her discovery. “She said, ‘This may not be the best place to tell you, but I’m too excited to wait,’” says Shannon. As soon as Shannon and her husband returned to their home in Saskatoon, Saskatchewan, they got online and found the Just Tri-It Triathlon Program, a three-month training program for first-time female triathletes in Saskatoon. There were three spots left, so Shannon snapped one up in a heartbeat. She flourished among the “amazing women from all walks of life, all fitness levels.” Within weeks, she was bilateral breathing like a champ, and her fitness and skills in all three sports were vastly improved. Shannon did. And finished third in her race. After that, there was no going back; she had become an honour runner. In 2005, Shannon returned to the race and entered to compete in the standard triathlon distance—a 1.5km swim, 40km bike and 10km run. She finished second. The following year, Shannon’s cousin Jason Loutitt invited her to join him in running the Boston Marathon in honour of Tom Longboat. Born on the Six Nations Reserve near Brantford, Ontario, Tom was a member of the Onandaga Nation. He’d stunned the running world in 1906 by winning a series of races, including the annual Christmas Day 10-miler in Hamilton, Ontario, which he finished in 54 minutes and 50 seconds, a full two-and-a-half minutes ahead of the previous Canadian record. In 1907, at 19 years of age, Tom won the Boston Marathon in two hours, 24 minutes and 24 seconds. His time was five minutes faster than reigning course champ John Caffrey’s best. “He was a boy who came out of nowhere and showed up at the start line, literally almost last at the start line, and he put on what looked like cloth on his feet, and he just looked disheveled and he ended up winning,” says Shannon. Tom went on to enjoy an impressive professional running career, winning the world professional indoor marathon championship in Madison Square Garden in 1909. He also ran for the Canadian army in World War I, both in exhibition matches and as a dispatch runner. In 1951, the Tom Longboat Awards were established to honour the achievements of gifted Indigenous athletes. In 2006, Jason and Shannon decided to return the favour. To mark the 100th anniversary of Tom’s Boston win, they planned to run the race in his honour with about 20 other Canadian athletes, including several runners from Longboat Roadrunners, a Toronto running club dedicated to Tom’s memory. Hoping to qualify for the event, Shannon ran the Queen City Marathon in Regina, Saskatchewan in September 2006. She just missed her category’s qualifying time of three hours and 40 minutes. But four weeks later, she ran another marathon in 3:35 and earned her spot at the Boston Marathon, which she ran in April 2007. Having cautioned the crew “not to expect much,” Shannon donned her gear and lined up at the starting line. As it turns out, it was a good thing she warned them to keep their expectations low; if she hadn’t, they might not have had the delightful surprise of watching her win the race. Cheered on by her family, Shannon pulled further and further ahead with each stage. By the time she hopped off her bike to start the run, there was no catching her. “Part of what drives me when I run is knowing that I’ll have my time alone with grandpa,” she says. “But in order to do that, I have to run a little faster than (everyone else).” She took off running and won the female division of the event’s standard distance. Three weeks later, during a treadmill workout, Shannon was overcome by how much her life had transformed in just a few years. With every footfall, she marveled at the events of the past three years and kept asking, “Why is this happening?” Suddenly, it hit her. “I understood that I was building my strength because my grandfather wanted to come home.” In that moment, Shannon committed to retracing Billy’s footsteps in his famous 100-mile rescue run, starting with where he finished in Edmonton and ending back home in Athabasca. As part of her training, she entered the Saskatchewan leg of the 2008 Canada ONExONE Run, an initiative launched by Kickass Canadian Ray Zahab through the ONExONE Foundation, which raises awareness of the need “to improve the health, wellness and vitality of our world’s children, one by one.” The ONExONE Run involved Ray running 80km in each of Canada’s 13 provinces and territories, and talking with schools along the way. It was Ray who recommended Shannon for this website. As kickass as he finds her, she has just as many compliments to send his way. “He’s an amazing guy,” she says. “He offered not only to help me in whatever way he could for training (for the ONExONE Run), but also to come out and run the entire distance with me.” Shannon took him up on his offer, and in May 2008, exactly four years after giving up her life as a self-professed couch potato, she and Ray led the largest relay run in Saskatchewan’s history. With help from nearly 30 schools throughout Saskatoon, they rallied more than 10,000 students to join in. 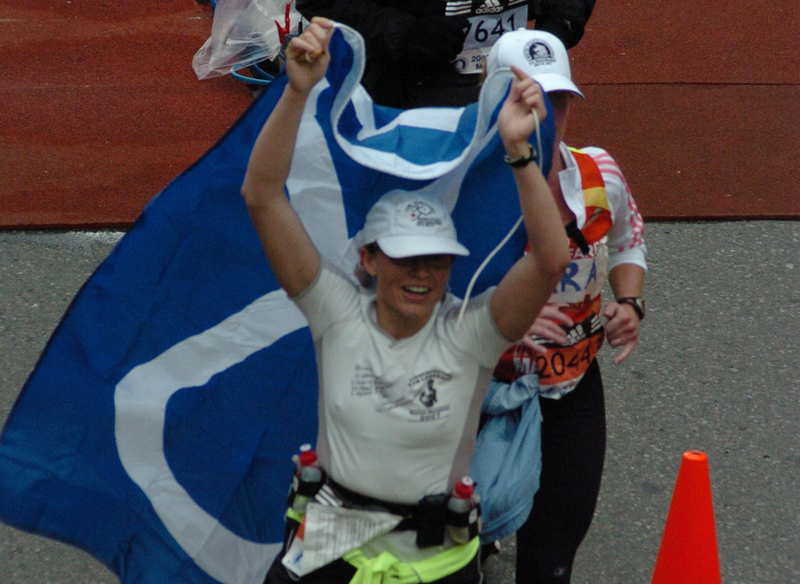 By July 18 of that year, Shannon was ready to do her greatest honour run to date. She completed most of the distance solo, but she wasn’t alone; in her hand was a moose hide pouch that contained her great-grandfather’s soil. 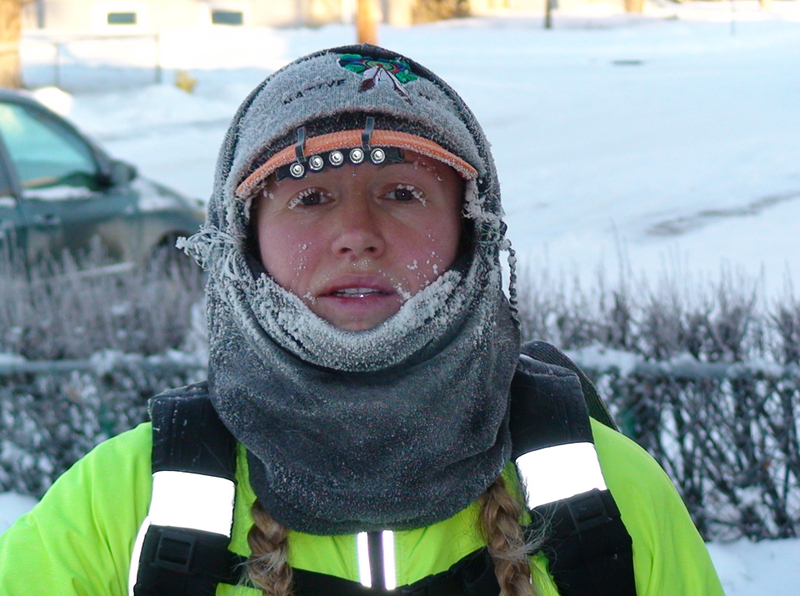 When she reached St. Albert, Alberta, more than 100 runners joined her for the last stretch of the journey. 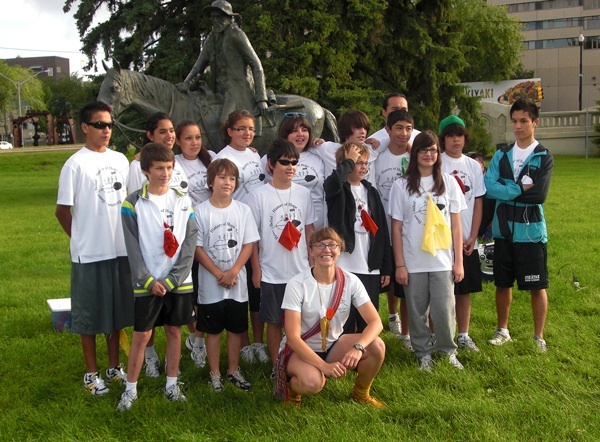 Shannon’s most recent honour run was the 2010 Journey Back to Batoche. Early that year, she learned of an upcoming Reconciliation Ceremony in Batoche, Saskatchewan to commemorate the fallen soldiers of the 1885 Battle of Batoche. 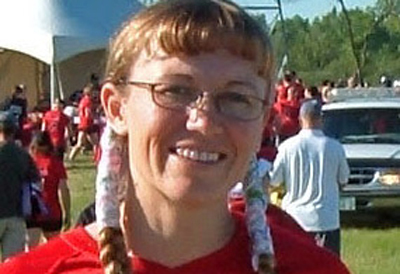 The ceremony was scheduled for July 18, 2010, so Shannon called the event coordinator and proposed running in her moccasins from Saskatoon to Batoche—just under 100km—on July 17 to honour the fallen soldiers. When her proposal was accepted, Shannon’s husband suggested it would be a great opportunity to introduce youth to honour running, something she’d been keen to do for awhile. “So that’s what we did,” she says. 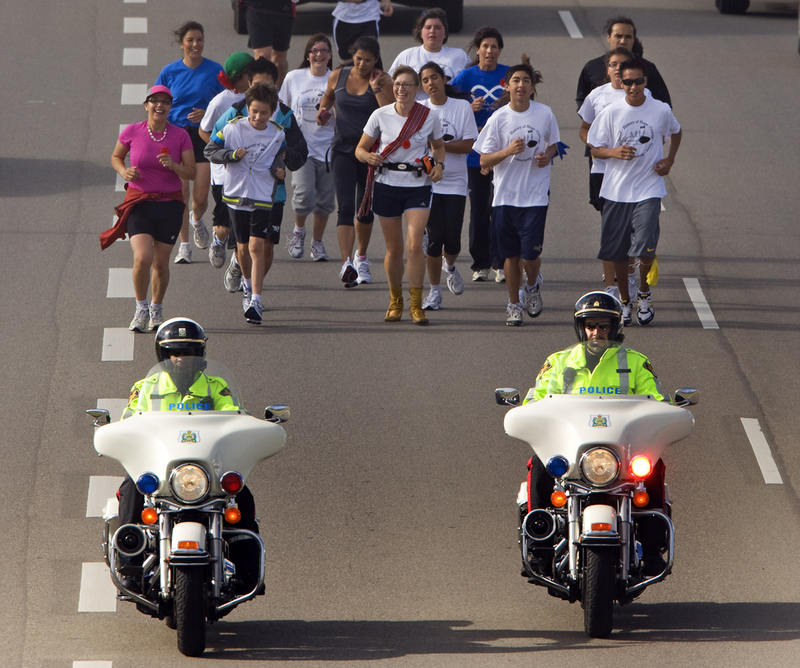 With Robert’s help, Shannon assembled 15 youth, aged 10 to 18 years, to run with her in a relay. 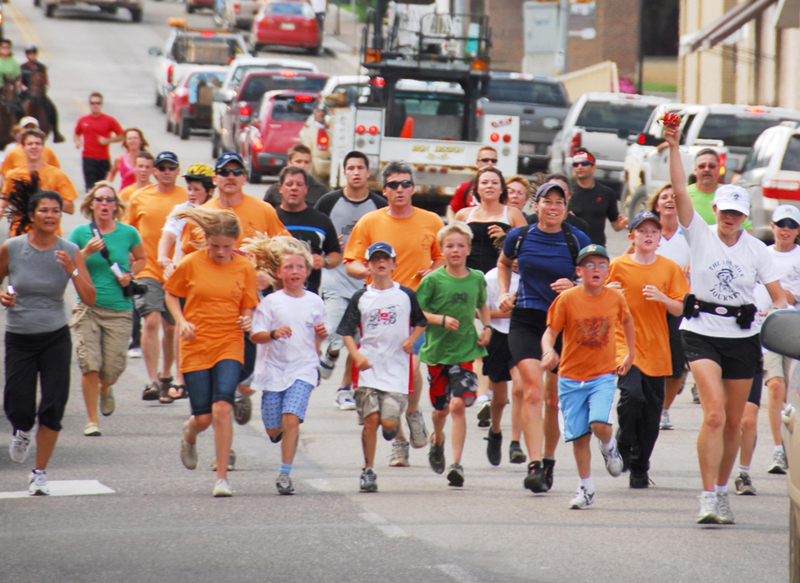 Over a period of 15 hours, she ran the entire way back to Batoche, while the youngsters ran beside her for distances ranging from 25km to 70km. When you consider that Shannon only began this journey in 2004, and when you hear the enthusiasm bubbling over when she talks about honour running, it’s clear she’s just getting warmed up. There’s no doubt she has many more honour runs to carry out. From now on, her focus will be on running and on honouring her family, her ancestors and her spirit. As she runs across Canada’s trails, every footfall will sound as an echo of her past and of the wonderful stories she carries with her. Congratulations on your running achievements. What a great tradition to rediscover amongst our family. My granddad was Colin Loutitt (married to Laura McLeod). Colin was most likely a nephew to Billy, living in Fort Chip. Nice to hear from you, Theresa! I agree – your family has a very proud tradition. Not only a Kickass Canadian, but also a Kickass person! Thanks for the comment, Don! Well said.